The U.S.’s lax gun laws and holes in gun trafficking enforcement are fueling a massive business of illegal arms trade through its southern border into Mexico. According to the Bureau of Alcohol, Tobacco, Firearms and Explosives (ATF), two out of every three illegal firearms found in Mexico originate in the U.S. In other words, each year, over 253,000 guns purchased in the U.S. are smuggled south of the border. The issue has proven truly complicated, especially in light of the 2006-2011 ATF “Fast and Furious” scandal. In the absence of effective methods to deal with U.S.-Mexico gun sales, Pedro Reyes, a young Mexican, has achieved a huge milestone in combating the illegal trade of guns. He has broken Mexico’s all-time record for the most voluntarily surrendered guns. But Reyes is not a member of law enforcement or government. He is an artist. Born and raised in Mexico, he has witnessed the effects of gun violence in his country, and he has decided to engage directly with the population most endangered by it. “I’ve always felt that one of the least productive activities is to complain. So, living in Mexico, I felt that there was something that could be done about the problem of guns that are illegally entering the country. I wanted to capture people’s imagination,” Reyes said. In 2007, Reyes began his project “Palas por Pistolas” (Shovels for Guns) in Culicán, Mexico. The art project made its debut by airing soap opera- style TV ads revealing the dangers posed by handguns. The commercials then invited citizens to voluntarily surrender (or donate) their guns in exchange for coupons that could be used in local stores – no questions asked. With support of local authorities and the Botanical Garden of Culiacán, Palas por Pistolas stayed true to its aim of curbing gun violence. Reyes melted and re-molded 1,527 civilian guns into gardening tools. He then organized public tree plantings using the shovels he created to show how an object used to destroy life could now be used to support life. In direct contrast to the parades, gun-shows, and gun-fairs that amount to public celebration of arms, Reyes’ project is a celebration of nonviolence. “There’s a kind of celebration where there’s a community day, and people do the planting. People have the opportunity to gather face-to-face in a public space and engage in something that becomes sort of a ritual,” he said. The ceremonial tree plantings have taken place worldwide, including in San Francisco, Paris, Denver, and Vancouver. Pedro Reyes’ art is statement against the “trigger happy” art industry. “[Palas por Pistolas] is more attempt of a cultural shift because the way that guns are portrayed in popular culture is very different from the impact they have in the real world,” he said. Since then, Reyes’ work of transforming guns into inspiring objects has taken on a new depth. 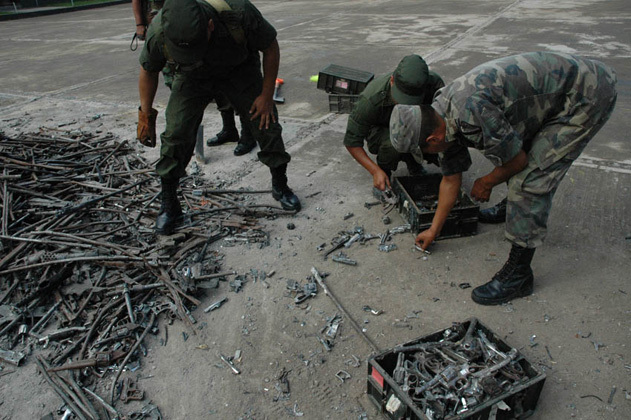 In Ciudad Juárez, the Mexican government provided Reyes with 6,700 destroyed weapons to be made into shovels for planting. With a growing following, Reyes has since launched “Imagine” and “Disarm,” two projects that transform firearms into instruments. Incorporating intricately crafted woodwinds and percussive instruments, the project sounds as beautiful as it looks. The fight against gun trafficking and violence will be waged on two stages – the cultural stage and the political stage. Interactive and direct, Palas por Pistolas encapsulates the type of work advocates are using to engage people in candid conversation about an otherwise controversial subject. From encouraging people to dispose of their guns to exposing young adults to the dangers they pose, Reyes believes political artwork can bring about real change. Alone, however, they are not enough. On the political stage, a tough rode lies ahead for curbing gun trafficking. According to a 2012 study by the The Igarapé Institute and the University of San Diego’s Trans-Border Institute, nearly half of all U.S. firearms dealers depend on business trade with Mexico to keep operating. The ATF reports the illegal business was about as large as $6.7 billion in sales. If illegal gun trafficking stops, so will the cash flow of nearly half of all U.S. firearms dealers. Gun lobbyists will do everything in their power to prevent this from happening. The Stop Illegal Trafficking in Firearms Act of 2013, a bipartisan bill introduced to Congress earlier this year, presents viable options in dealing with the issue. The bill would help both Mexico and the U.S., by better equipping law enforcement officials to investigate and prosecute gun trafficking and straw purchasing (a process were a person buys a gun for someone else who is prohibited from buying one himself). Even President Obama has recognized the importance of addressing the illegal business. During a speech earlier this year at the National Museum of Anthropology in Mexico City, he said U.S. gun policy reform can “save lives here in Mexico and back home in the United States.” If Pedro Reyes can gain a little momentum in the upper echelons of the political sphere, he may be able to help solve a truly important international issue. Tags: arms trafficking, army, art, border, gun trade, guns, illegal, imagine, international relations, mexico, military, music, pedro reyes, politics, U.S., World Policy Journal. Bookmark the permalink.